Now in its sixth year, this family-friendly arts fest has quickly become a headline act on the outdoor events scene in Arlington. Stop by and check out 100-plus national, regional and local artists showcasing original works in a diversity of mediums, including ceramic, drawing, fiber, glass, leather, metal, photography and more. After you’ve picked up a few treasures, stick around for the festival’s daily lineup of free concerts and tasty food and beverages. Friday, 3-8 p.m.; Saturday, 10 a.m. to 6 p.m.; Sunday, 11 a.m. to 5 p.m. Lawn chairs recommended. Get more tips for your visit. Experience the 30th anniversary U2’s legendary Joshua Tree album at a once-in-a-lifetime concert at AT&T Stadium. Friday at 7 p.m. Find a nearby restaurant or bar. The Rangers host the Rays in a Memorial Day showdown at Globe Life Park. Promotion: Patriotic Rangers caps. Find out more and get tickets. Monday at 7:05 p.m.
Take your pick of three free shows, or take in all three acts on deck for Memorial weekend: Indie artist Sarah Jaffe (Friday at 8 p.m.); rocker Jonathan Tyler (Saturday at 8 p.m.); or Grammy-nominated Tejano music from La Tropa F (Sunday at 8 p.m.). Get tips for your Levitt visit. Start your summer on an adrenaline high with world-class thrill rides, live entertainment and more—and if it gets hot, you can cool off with that yummiest of Six Flags traditions, like pink thing Dippin’ Dots. Friday, 10:30 a.m. to 8 p.m.; Saturday-Monday, 10:30 a.m. to 10 p.m. Get Six Flags tickets. Hailed by the legendary Richard Avedon as “the greatest photographer of women,” Milton Greene’s subjects included luminaries like Audrey Hepburn, Frank Sinatra and Elizabeth Taylor, just to name a few, and his most famous subject, Marilyn Monroe. Friday and Saturday/Monday, 10 a.m. to 5 p.m.; Sunday, 1 p.m. to 5 p.m. Enjoy a fun-filled musical romp with the fashion-savvy, always-perky, always-pink Elle Wood, a UCLA sorority girl whose improbable admission into Harvard Law School results in a series of hilarious adventures and a feel-good journey of self-discovery. Friday and Saturday at 8 p.m.; Sunday at 2:30 p.m.
One of Arlington’s best-kept secrets is also one of our coolest attractions. Now showing: “Phantom of the Universe”, “Pink Floyd”, “Big Bird’s Adventure”, “Astronaut”, and “Secrets of the Cardboard Rocket.” Friday through Sunday – see website for showtimes. Sunny or cloudy, there’s nothing like a picnic in the park, an early morning nature walk, or a few turns on the swing set with your kids to start your summer right. Most Arlington parks open daily from 5 a.m. to 10 p.m., find one near you. Take advantage of an extra day of play to indulge in deep-dive fun at destinations like Alley Cats (arcade games, Putt-Putt golf, bowling and more); K-1 Speed (it’s not your daddy’s go-kart, baby); the International Bowling Hall of Fame (who doesn’t need a customized bowling ball? ); Dyno-Rock (indoor climbing for all ages and abilities) and other family-friendly Arlington attractions. 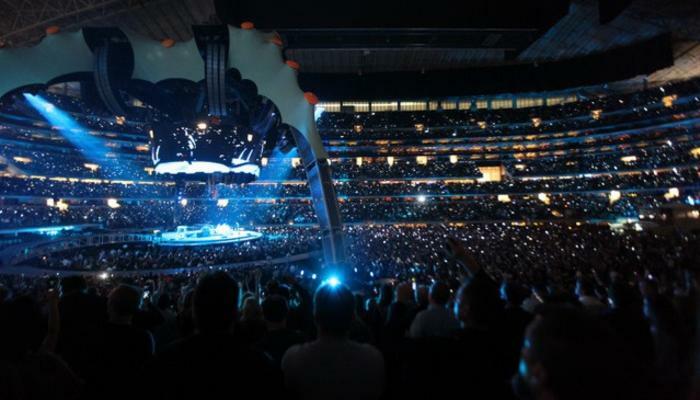 Photo credit: U2 in their 360 degree world tour in 2009 at AT&T Stadium.